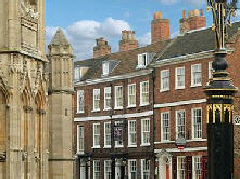 This popular town house hotel benefits greatly from its position at the heart of the famous city of York - the hotel is even overlooked by the city’s magnificent Minster. Unsurprisingly, the name gives away the historic connection. But, in this case, Guy Fawkes was no mere visitor - he is reputed to have been born on the site in 1570. It should be noted, though, that the claim is also made by another nearby property. But, whatever the truth, he was certainly baptized in the Church of Saint Michael le Belfry opposite. As it is, the existing building dates largely from the early 1700’s and is certainly full of period character, lit by gas lamps and full of nooks and crannies. But this isn’t a theme pub… it’s a real one. Offering 13 rooms in all including “The Belfry Suite”, the Guy Fawkes Hotel also possesses its own restaurant.